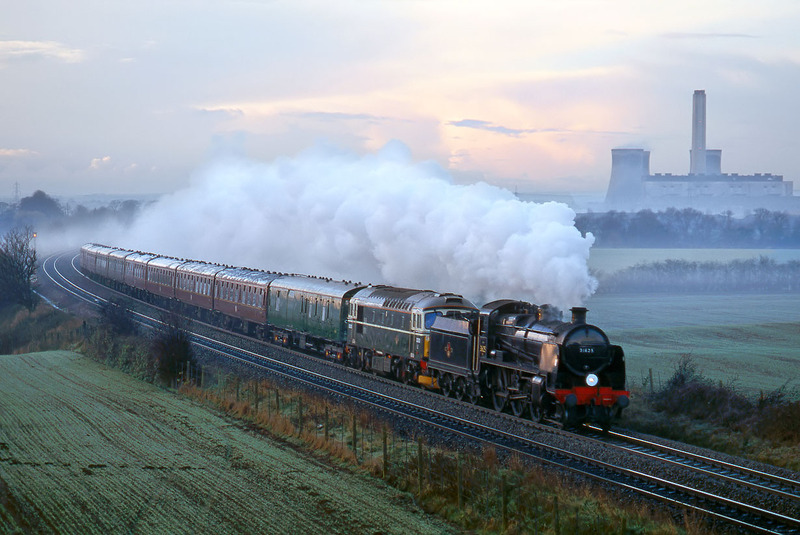 Just after dawn on 22 November 1997, U Class 2-6-0 31625 & Class 33 D6593 approach Culham with the 'Pines Express' Guildford to Crewe railtour. Normally pictures taken in these kind of conditions are not worth showing, but I think the result here is very atmospheric. With a little colour in the sky, mist rolling across the fields and the rising sun just highlighting the sides of the coaches and the steam locomotive's smoke deflectors, it makes an interesting picture, and of course with Didcot Power Station in the background, there is no mistaking the location!